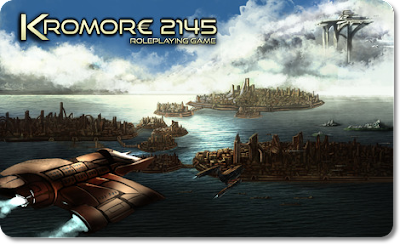 We were contacted by some local gentlemen about a Kickstarter Project they have going on and they gave us the opportunity to preview their new RGP called Kromore 2145. Created by T. Julian Bell at R.A.EX Games, Kromore is a RPG based on a system (AKA RAEX system) that Julian started to design in 2007. At the basic level, it uses three combat open actions during a players turn. The actions may be to move, cover, attack and so on. And based on my reading of the manual, what you do determines the number of actions needed. For example, you want to walk, that might be one action leaving you with two more to use, but say you want to pull out a massive gun to destroy your enemy, that could cost you 3 actions thus ending you turn. Either way, how you spend those actions is the strategy of the game and in a way doesn’t tie you down to a system that gives you a quick action and a normal action in a turn. In my simple mind based on the RPGs I have played or currently play, this mimics really how we do things and provides some structure. Here is what I am talking about, say in one RPG you want to throw a knife. The first quick action you have is to pull out the knife, and then the second action which is an attack, would be throwing the knife. In the RAEX system, the manual may define that pulling the weapon is an action, throwing the knife is an action, leaving you with one action which could be take cover. Or say you want to pull out a knife, take aim and then throw, thus not letting you take cover, your choice. One could argue that other games allow for this as well and I am sure they do, but Kromore details this out for a whole bunch of stuff. The book they are producing has a ton of detail and information in it, more than I expected when I first began to read it, so much so that I was a bit overwhelmed. This is definitely a thinking person’s RPG. The character creation is very deep, the weapons are fully detailed, and the skills/professions/etc give you a very open system. For example in the current RPG that we play, we needed to figure out the damage that was caused by a door being splintered due to an explosion. It wasn’t really defined like we wanted and we made due by using other concepts from the book. In Kromore, it is defined nicely on page 145 of the promo pdf rule book. Also, how much damage could the door take, is the wood treated or not? That determined how much damage the door could take. I liked that and it was easy to find. Like I stated, I am sure other RPGs have all this in them, but I don’t play theseRPGs, so I appreciate that RAEX Games included it in their first attempt. So, if you are in the mood to try a different RPG than maybe the one you are doing that is heavier than maybe consider checking out Kromore 2145 out and for $20, pick up the pdf copy. Unfortunately, this game is way to in-depth for me and would require a lot more attention than I am able to provide. The game will close on Kickstarter on 10/4 and is just over 50%. If it doesn’t make it, RAEX states they will relaunch if it doesn’t get funded.